Save 34% off the MSRP on these 3" x 0.83" Solon Care™ Cotton-Tipped Applicators with Wood Shafts (Q Source SKU: S012-000008) when you use our FPF071114 Coupon Code. This Featured Product Friday (FPF) promo is valid from today, July 11, 2014 through Sunday, July 13, 2014 (Please note: Limited quantity in-stock and ready-to-ship). 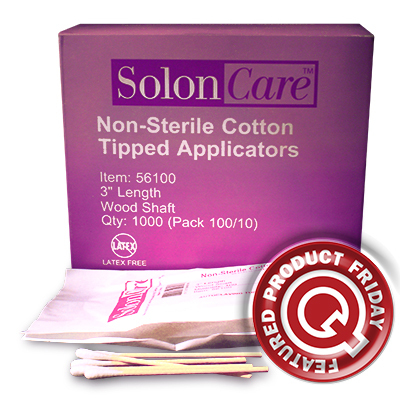 The Solon Care Cotton-Tipped Applicator w/Wood Shaft (MFG Part Number: 56100) features medical-grade cotton, is ISO 9001 certified, and is perfect for first aid and veterinary applications. Regularly listed at $7.02, but with our FPF code savings you’ll get it for just $4.65. While this is a 3-day limited-time price, the coupon is unlimited. Use the code as many times as you like while it is valid—and please feel free to share the code with your friends & colleagues, too. For further questions about Featured Product Friday, please read our informational blog post, call us (800-966-6020), or send us an email. This promo is valid only at QSource.com.